Network monitoring is a tool that monitors network connections and processes (applications and services) currently running on the computer. This tool shows you detailed listings of all TCP and UDP endpoints of your system including owner process name, remote address and state of TCP connections. The Process column shows the name of the program, the Protocol column shows the protocol type, the Local Address column shows the local Ip address, the Local Port column shows the local port, used with the specified process in the local computer, the Remote Address column shows the remote Ip address, if the specified process has an established connection with a remote computer and N/A otherwise, the Remote Port column shows the remote computer’s port used for the process that has a connection with the specified process, and 0 if there is no connection with remote computer, the State column shows the connection state, the Hostname column shows the remote host name, the Country column shows the country, the Service Name column shows the service name, the Service Description column shows the description of the specified service. information includes Task, Description, Progress, State, Level, Notify. You can switch from one task to another by selecting appropriate row. Close Connection – closes the connection with selected process. Close Process - terminates the process . Process Properties – opens the Process Details dialog. Who Is Remote Host – for TCP conections opens the WhoIs resolver dialog. Trace Route Host - for TCP conections opens the Tracert dialog. Abuse Address – shows the abuse address of remote host. RBL Check - checks if the specified host is in a Real-time Black list for spammers “RBL “. 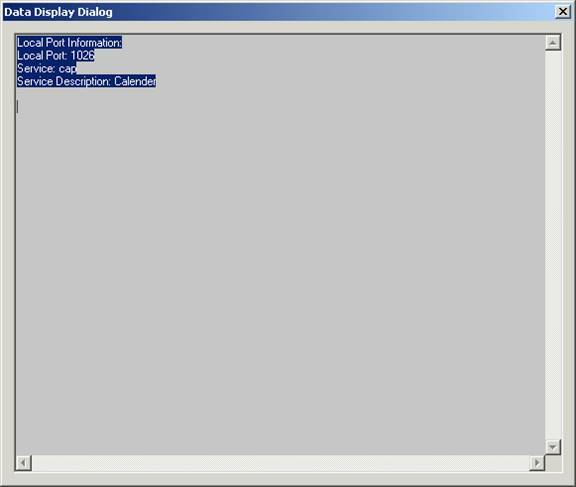 Advanced Information – opens DataDisplay dialog. Copy Row – copies the selected row. Double-clicking on the row shows Process Details dialog. The Data Display Dialog contains the following information: local port information, local port, service, service description.